Gold Mayan Angel handmade soap with notes of vanilla, fresh citrus, melons, peaches, plums, amber, chocolate, sandalwood and patchouli. 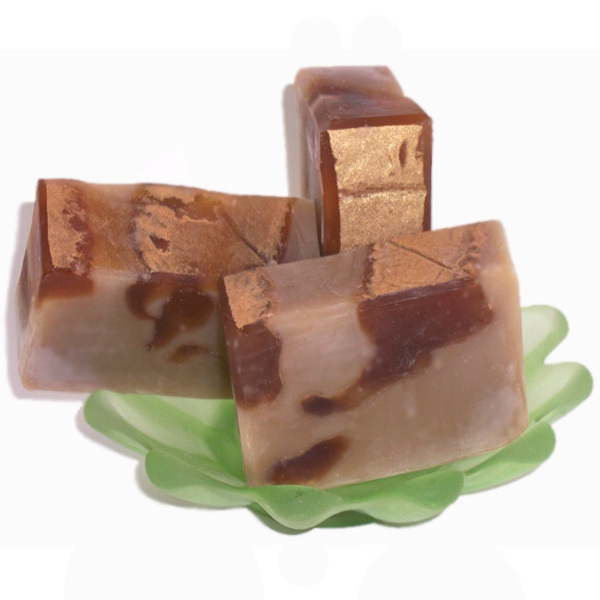 A luxurious cold process soap with gold mica and exotic fragrance. Gold Angel handcrafted artisan soap has top notes of pink grapefruit, fresh mandarin and sweet neroli. The middle notes consist of herbal clary sage, sparkling citrus, ripe melons, peaches, and plums, with base notes of amber, sweet caramel, chocolate, patchouli and vanilla. What a sultry and exotic scent! Each Mayan Angel bar is swirled with glycerin soap that has gold mica for a true luxury. I make all my handcrafted soaps here in Palm Springs, California. This batch was made from scratch using olive, coconut, palm kernel, castor and enriched with mango butter. Gold Digger Mayan Angel soap is a mild luxurious bar with nice and creamy lather. The scent will softly linger on your skin. Soap up with this piece of heaven with an earthly price in your bath or shower. Ingr: Olive oil, Coconut, Palm Kernel, Mango Butter, Castor oil, Soybean, Sodium Hydroxide, Beeswax, Fragrance, Sodium Lactate, Gold Mica.